God will change the understanding and expression of Christianity in the earth in one generation. Jesus’ Bride will be holy, radical and set apart for Him. She will be zealous for His purposes in this time as she awaits the imminent return of her Bridegroom. Many will arise as shepherds after His own heart (Jer 3:15), who will carry the forerunner spirit and arise from the place of prayer as Friends of the Bridegroom to awaken this generation to passion for Jesus in every arena – schools, marketplaces, local churches and more. IMMERSE INTERNSHIP is a one-month full-time program for those seeking to become part of this finest generation through experience as an intercessory missionary in the context and environment of a House of Prayer in Singapore. This year’s internship includes a 3-day 2-night camp, on the prophetic promises for this generation and how to step into these promises that are coming to pass in this time. Set aside four weeks this year to jump in and immerse yourself in all that God is doing in our time. The Holy Spirit is more than power to be harnessed, but is a Person to be followed and our Lord to be submitted to. The Holy Spirit was given to us for more than anointed and effective ministry; He was given to reside in us, to lead us and to transform us to become more like Jesus. Join us for three Sundays as we look at different passages in Scripture, including John 14-16 and Galatians 5:16-6:8, to learn more about the Person of the Holy Spirit and how to walk with Him so that we can be ones who know Him intimately and commune with Him constantly. Jesus Christ is the only answer in the coming storm. Being rooted in a real, deep and authentic relationship with Him is the only way forward. This is a time to radically ALIGN with His heart, ways and will! With the new year, our Youth and Young Adult Prayer Room Sessions have shifted to a new day and time. We welcome all youth and young adults to join us to worship and pray, and contend for the fullness of all God has for our generation. In September 2018, on our 15th Anniversary as a House of Prayer, the LORD spoke very clearly to us on the need for ALIGNMENT in 2019. As I reflect on this Word and what the LORD has been speaking to us over the past 10 years, it is obvious that He was preparing us for shifts in the House of Prayer movement and in the world. There has been an obvious seismic shift for the worse in the world; yet it is a new era for the global House of Prayer movement! IHOP 2.0 is here! 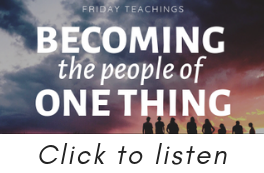 Our weekly Friday teachings are free and open to the public. Click here for full teaching schedule..